On the 12th and 13th of September, the Contamination Expo series opened its doors once again to professionals working in the sector of environmental contamination. Situated in the Land Remediation area, we engaged with existing members, recent graduates and attendees from a variety of sectors working in the field of land condition, discussing the breadth of activity and pace of innovation within the sector. The IES offers stepping stones on a career path from Student to Chartered status and beyond. Our Land Condition Community supports our members working in this sector, now our largest specialism. A new intiative launching later this year is our Early Careers Network, a platform for land condition professionals in the early stages of their career to learn, improve presentation skills and network with peers. To further explore the challenges early career professionals face coming into the sector, Adam Sokolowski, Head of Contaminated Land and Remediation at TRC in the UK, full member of the IES and founding member of the community, presented a seminar on the ‘Anatomy of a Brownfield Specialist.’ What does a brownfield specialist of tomorrow look like and what is the industry asking of them? 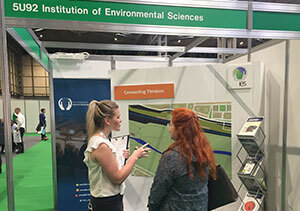 Across the two days, our stand’s interactive activity provoked many discussions around the topic of land remediation and challenged many willing participants to attempt to remediate a contaminated fictitious site previously home to a gas works. In 1938 this fictitious site held an active gas works. In 1989 the site was developed and the gas works were removed, opening up the space for public parkland. It is known that during this development all above-ground structures were removed and underground gas holders were infilled and then capped with topsoil. Trees were planted along the paths and near to the new café development. It has been noted that trees are not growing well and discoloured bark and leaves are becoming more widespread throughout the area. 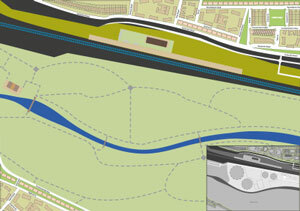 The parkland is now being considered for redevelopment. With this information, participants were asked to plot on the map the points in which they would drill trial pits and boreholes to ascertain if any contaminants from the old gas works are affecting sensitive receptors. Some of our expert members working in land condition plotted their results. The attendee with the closest match and winner of our competition was James Gooding at TRC Solutions. Over the coming months, we will be launching our Early Careers Network for professionals in the first 10 years of their career. In March 2019 our technical one-day conference, the Land Condition Symposium, will be returning, moving location to a northern city. Further details and booking instructions about both of these events along with a webinar with Peter Fleming on a new ground-breaking method in TPH Analysis will be on our events page soon. With so many land condition professionals feeling the pressure to become Chartered, in the new year, we aim to further support our members working in this sector by writing sector-specific advice for land professionals looking to achieve their Chartership. You can book a place on our next CEnv in a Day and become Chartered by the end of the year. Thank you to all those who came to our stand, join our Land Condition Community to stay in touch with our activities in this sector. We hope to see you at our future events.